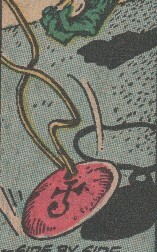 Powers/Abilities: Tammuz is presumably immune to aging and conventional disease. He presumably possesses superhuman physical abilities. In his limited appearances, Tammuz granted some of his own magical power to the Heart of Tammuz. He could manifest on Earth as a giant energy creature of great power, perhaps 50' tall, and strong enough to grapple with and overpower Nergal. (Myth history) - Dumuzi is a member of the Anunnaki, an extradimensional race of beings who were worshipped as gods by the people of ancient Sumeria and Babylon. One of the most loved goddesses of the Anunnaki was the goddess Ishtar, known as Inanna to the Sumerians. Ishtar took Dumuzi to be her lover, but he was abducted to the underworld by Ereshkigal, goddess of the dead. Eriskegal hated Ishtar for being favored among the gods, and when Ishtar went into the underworld to free Dumuzi, Eriskegal forced her to leave an article of clothing at each of the nine gates to the underworld. Eriskegal had Ishtar imprisoned in the underworld, but she was freed by the god Dagon, then known as Enlil. Ishtar petitioned the gods for the release of Dumzi from the underworld, but eventually it was required that he had to live half the year as gatekeeper of the underworld and the other half on earth with Ishtar. (Savage Sword of Conan#230 (fb) - BTS) - The Heart of Tammuz, along with its counter-talisman, the Hand of Nergal, came into the possession of the sorcerer Xaltotun of Acheron. (Savage Sword of Conan#229 - BTS, 230) <13000 B.C.> - Xaltotun considered using the Hand of Nergal and/or the Heart of Tammuz against a time-traveling Red Sonja when she stole the Heart of Ahriman from him. He initially decided it was too complicated, but when she escaped his chamber he summoned the Heart of Tammuz to monitor her flight. However, the Heart of Tammuz' refused to reveal this information, presumably due to the shields of the Heart of Ahriman. (Conan the Barbarian I#30 (fb) - BTS) - The Hand of Nergal was brought to Munthassem Khan, satrap of the Northern Turanian city of Yaralet; and from that point on, Munthassem became cruel and savage. (Conan the Barbarian I#30 (fb) - BTS) - King Yildiz sent his army, including Conan of Cimmeria, to battle Munthassem Khan's legions. While Yildiz's army lay encamped at Bahari, Conan found the Heart of Tammuz. Though he knew not what it was or what power it held, he wore it as a necklace. (Conan the Barbarian I#30) - Munthassem used the Hand of Nergal to summon winged devil-beasts -- the Shadows of Nergal -- that descended upon and slaughtered Yildiz's troops. When one of them threatened to slay him, Conan unwittingly grasped the Heart of Tammuz, causing the devil-beast and its brethren to flee. After recovering from his magical injuries, Conan's service was enlisted by a Brythunian woman, Hidilco, who had been sent by her master, Atalis the Far-Seeing, to recruit the Cimmerian. The Hand of Nergal unleashed the monstrous form of Nergal. At the same time, a nimbus of writhing scarlet surrounded the Heart of Tammuz, the warmth of a thousand suns flowing from it, negating the darkness and cold of Nergal. Within moments the crimson fog had become a gigantic figure of intolerable light -- dimly manlike in configuration -- yet huge as those colossi hewn from the stone cliffs of Shem by age-forgotten hands. The two forces clashed with a roar like colliding winds; Nergal gained the early advantage, but then Tammuz' all-pervading brightness dissolved Nergal's dark form. For another moment, Tammuz towered above Munthassem Khan's dais, consuming it as if it were a funeral pyre, and then Tammuz vanished as well. The Heart and Hand vanished, and Munthassem Khan was gone, as well, leaving behind only a handful of smoldering ashes. Atalis commented, "The Heart is ever stronger than the Hand." (Savage Sword of Conan#220) - Years later, Conan -- now leading a fighting force including the Free Companions and the Kozaks on the steppes west of Turan, rode to Northern Turan in search of allies. Conan's forces were suddenly assaulted by the immense magical Hand of Nergal, which decimated them until turning back into mist and vanishing back toward Yaralet. Conan and several other warriors traveled to Munthassem Khan's former quarters, where they were confronted by Atalis who revealed his involvement. Atalis and also revealed his warrior servant, Fafnir of the Demon Hand, whose own demonic Arm of Kx'ulthuum had been merged with the Hand of Nergal by Atalis. 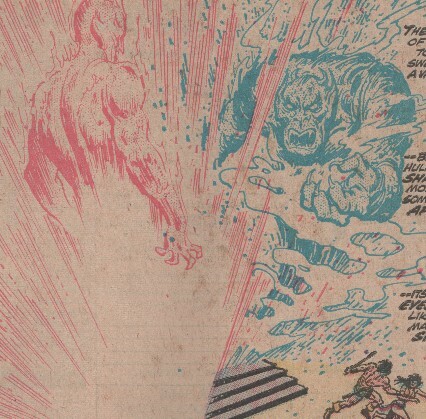 (Savage Sword of Conan#221) - Fafnir obeyed Atalis' orders and savagely defeated Conan, taking a brief moment to strike down Conan's allies with a magical blast. From his dungeon, Conan slyly advised his new female ally Taqui to win Atalis' heart. Atalis drew the Hand's power against Tacqui to make her more compliant, but when he stopped she broke free from him, grabbed the Heart of Tammuz, and fled. She ran into Conan, and when Fafnir attacked Conan again, Tacqui struck the Heart of Tammuz against the Hand of Nergal, stunning Fafnir. Conan defeated Atalis, and Fafnir recovered, the Heart of Tammuz having merged with the Hand of Nergal, granting Fafnir control of his own will and full control of his new arm's power. He is called 'the Shepherd' and 'lord of the sheepfolds'. As the companion of Nigizzida 'to all eternity' he stands at the gate of heaven. In the Sumerian Descent of Inanna he is the husband of the goddess Inanna, the Sumerian counterpart of Ishtar. According to the Sumerian King-List Gilgamesh was descended from 'Dumuzi a shepherd'. Dumuzi was originally a mortal ruler whose marriage to Inanna ensured the fertility of the land and the fecundity of the womb. This marriage, however, according to a myth whose denouncement has only recently come to light, ended in stark tragedy when the goddess, offended by her husband's unfeeling behavior toward her, decreed that he be carried off to the netherworld for six months of each year-hence the barren, sterile months of the hot summer. At the autumnal equinox, which marked the beginning of the Sumerian new year, Dumuzi returned to the earth. His reunion with his wife caused all animal and plant life to be revitalized and made fertile once again. Dumuzi was the basis for the later legend of Adonis among the Greeks. 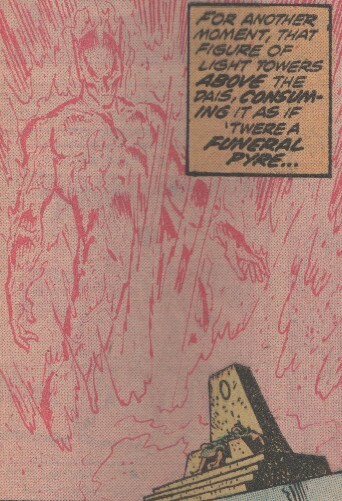 Dumuzi appears as gatekeeper to the dead in the episode, "Descent," in the TV-series, "Hercules - The Legendary Journeys." Was he married to Inanna? Varies. Some tales, he and Inanna are just lovers, but in others, they're considered husband and wife. I prefer the lovers-angle because it hews closer to the legend of Venus and Adonis to which was derived from it. And yes, sometimes he's considered a mortal and in others a god. My best translation is like Osiris and several others in others myths, he lived as a mortal but not reaching godhood yet. This happens in several stories. The exact version of this tale isn't set in stone like Greek myths and is often subject by the person deciphering it. In the Annunaki entry in All-New OHotMU Update#3 Tammuz has a paragraph. Only a woman can command the power of the Heart of Tammuz under normal circumstances. It has taken both discoid and spherical forms. The Heart came into the possession of Xaltotun of Acheron circa 13,000 B.C., and Xaltotun persuaded a Stygian sorceress to grant him enough of her aura to accomplish that purpose--three seconds before he slew her. Xaltotun rested the Heart of Tammuz (in its spherical form) within the Hand of Nergal's clutch. 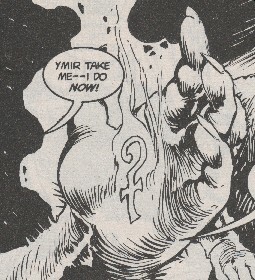 When a time-traveling Red Sonja stole the Heart of Ahriman and escaped from his chambers, Xaltotun tried to use the Heart of Tammuz to monitor the direction of her flight. However, the Heart of Tammuz' refused to reveal this information, presumably due to the shields of the Heart of Ahriman. The Heart of Tammuz (in its spherical form) was found in Bahari in Northern Turan by Conan circa 10, 000 B.C., and it protected him from the assaults of Munthassem Khan who held the Hand of Nergal, and Hidilco of Brythunia used it to knock the Hand of Nergal out of Munthassem Khan's grip, after which Tammuz and Nergal appeared, and Tammuz vanquished Nergal. 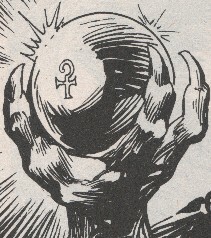 Atalis regained both the Heart of Tammuz (again in its spherical form) and the Hand of Nergal, using the latter to subdue the people of the hills as part of his plan to conquer Turan. Though unable to use the power of the Heart of Tammuz, he kept it in his possession (mounting it on the end of a staff) to prevent others from using it against him. He merged the Hand of Nergal with Fafnir's Arm of Kx'ulthuum, enslaving Fafnir to his will. Atalis sent a magical construct of the giant to oppose his enemies as he plotted to conquer the hill people, but lost its power after Fafnir's merged Hand was further combined with the Heart of Tammuz. Fafnir was left with the Hand's power but freed from outside control.